Sellafield is a nuclear fuel reprocessing and nuclear decommissioning site, close to the village of Seascale on the coast of the Irish Sea in Cumbria, England. The site is served by Sellafield railway station. Sellafield incorporates the original nuclear reactor site at Windscale, which as of April 2019 is undergoing decommissioning and dismantling, and Calder Hall, a neighbour of Windscale, which is also undergoing decommissioning and dismantling of its four nuclear power generating reactors. It is the site of the world's first commercial nuclear power station to generate electricity on an industrial scale. Sellafield was originally owned and operated by the Ministry of Supply (MoS), then from 1954 by the United Kingdom Atomic Energy Authority (UKAEA) and then, following the division of UKAEA in 1971, by British Nuclear Fuels Ltd (BNFL). Since 1 April 2005, it has been owned by the Nuclear Decommissioning Authority (NDA) and is now operated by Sellafield Ltd. In 2008, the NDA awarded Nuclear Management Partners (NMP) the position of Parent Body Organisation of Sellafield Ltd. under their standard management model for NDA sites. This consortium, composed of US company URS, British company AMEC, and Areva of France, was initially awarded a contract for five years, with extension options to 17 years. On 13 January 2015, the NDA announced that NMP would lose the management contract for Sellafield Ltd. as the "complexity and technical uncertainties presented significantly greater challenges than other NDA sites", and the site was therefore "less well suited" to the NDA's existing standard management model. The new structure, which came into effect on 1 April 2016, saw Sellafield Ltd. become a subsidiary of the NDA. Activities at the Sellafield site primarily support decommissioning of historic plants, and reprocessing fuel from UK and international nuclear reactors. Decommissioning projects include the Windscale Piles, Calder Hall, historic reprocessing facilities, waste stores, as well as other clean-up projects on the site. Reprocessing plants include the THORP nuclear fuel reprocessing plant, the Magnox nuclear fuel reprocessing plant, and the Waste Vitrification Plant. The site contains several nuclear waste stores, with the Low Level Waste Repository 6 km away at Drigg. The UK's National Nuclear Laboratory also has its Central Laboratory on the Sellafield site. Sellafield was a small rural community situated on the west (Irish Sea) coast of North-West England in the current county of Cumbria (and formerly in the pre-1974 county of Cumberland) in the parish of St Bridget Beckermet between the rivers Calder and Ehen. It consisted of High Sellafield (to the north, and which still exists) and Low Sellafield, which became incorporated in the Sellafield Royal Ordnance Factory (ROF) during its construction in the Second World War. The coming of the railway to west Cumberland in the mid-19th century, and the opening of Sellafield station and Sellafield junction (for the branch line to Beckermet and Egremont, Cumbria), provided important transport links for a remote part of England. ROF Sellafield was constructed by John Laing & Son in 1942 at Low Sellafield as a Second World War ROF. The nearby sister factory, ROF Drigg which produced TNT (trinitrotoluene) had been constructed in 1940, 5 km to the south-east and adjacent to the village of Drigg. ROF Drigg and ROF Sellafield were built in these isolated and remote coastal sites because of the hazardous nature of the process and to minimise the risk of enemy air attack. They were both classed as Explosive ROFs specialising in high-explosive TNT (ROF Drigg) and propellant (ROF Sellafield), and production ceased at both factories immediately following the defeat of Japan. After the war, the Sellafield site was briefly in the ownership of Courtaulds for development as a factory, but was reacquired by the Ministry of Supply to adapt the site for the production of materials for nuclear weapons, principally plutonium. Construction of the nuclear facilities commenced in September 1947. The site was renamed Windscale Works (after Windscale Nook, a bluff on the north bank of the River Calder) to avoid confusion with the Springfields uranium processing factory near Preston. The building of the nuclear plants at Windscale Works was a huge construction project, requiring a peak of 5,000 workers. The two air-cooled and open-circuit, graphite-moderated Windscale reactors (the "Windscale Piles") constituted the first British weapons grade plutonium-239 production facility, built for the British nuclear weapons programme of the late 1940s and the 1950s. Windscale Pile No. 1 was operational in October 1950 (just over three years from the start of construction at Sellafield), and Pile No. 2 in June 1951. Pile 1 was the site in 1957 of the Windscale fire, the worst nuclear accident in UK history, ranked in severity at level 5 out of a possible 7 on the International Nuclear Event Scale. Windscale was later also the site of the prototype British advanced gas-cooled reactor. With the creation of the United Kingdom Atomic Energy Authority (UKAEA) in 1954, ownership of Windscale Works passed to the UKAEA. The first of four Magnox reactors became operational in 1956 at Calder Hall, adjacent to Windscale and across the River Calder, and the site became Windscale and Calder Works. Following the break-up of the UKAEA into a research division (UKAEA) and a production division, British Nuclear Fuels Ltd (BNFL) in 1971, the major part of the site was transferred to BNFL. In 1981 BNFL's Windscale and Calder Works was renamed Sellafield as part of a major reorganisation of the site – up to that time there was a General Manager of Windscale Works and a General Manager of Calder Works, but afterwards there was one Head of the entire BNFL Sellafield site – as well as to possibly attempt to disassociate the site from press reports about its safety. The remainder of the site remained in the hands of the UKAEA and was still called Windscale. Since its inception as a nuclear facility, Sellafield has also been host to reprocessing operations, which separate the uranium, plutonium, and fission products from spent nuclear fuel. The uranium can then be used in the manufacture of new nuclear fuel, or in applications where its density is an asset. The plutonium can be used in the manufacture of mixed oxide fuel (MOX) for thermal reactors, or as fuel for fast breeder reactors, such as the Prototype Fast Reactor at Dounreay. These processes, including the associated cooling ponds, require considerable amounts of water and the licence to extract water from Wast Water, formerly held by BNFL, is now held by the Nuclear Decommissioning Authority. On 19 April 2005, leaked radioactive waste was discovered from ThORP (Thermal Oxide reprocessing plant) through a crack into a sump chamber which may have started as early as August 2004, and was categorised as a level 3 event on the International Nuclear Event Scale, resulting in fines. In February 2009, NuGeneration (NuGen), a consortium of GDF Suez, Iberdrola and Scottish and Southern Energy (SSE), announced plans to build a new nuclear power station of up to 3.6GW capacity at Sellafield. In October 2009, NuGen purchased an option to acquire land around Sellafield from the NDA for £70m. On 2 June 2010, Sellafield's gates were closed as a precaution in the wake of a deadly shooting spree and subsequent police manhunt, and the afternoon shift was told not to come to work. This was the first lock-down in the history of the plant. On 18 October 2010, the UK government announced that Sellafield was one of the eight possible sites it considered suitable for future nuclear power stations. On 23 June 2011 the government confirmed the suitability of the site, and hoped an electricity generating company would choose to build a power station near Sellafield at Moorside by 2025. In 2003, it was announced that the Thorp reprocessing plant would be closed in 2010 (later extended to 2018 to allow completion of agreed contracts). Originally predicted to make profits for BNFL of £500m, by 2003 it had made losses of over £1bn. Subsequently, Thorp was closed for almost two years from 2005, after a leak had been undetected for 9 months. Production eventually restarted at the plant in early 2008; but almost immediately had to be put on hold again, for an underwater lift that takes the fuel for reprocessing to be repaired. In November 2008, Sellafield was taken over by a new consortium (US company URS Corp., Areva and the UK company Amec) for decommissioning, as part of a 5-year £6.5bn contract. In October 2008 it was revealed that the British government had agreed to issue Sellafield an unlimited indemnity against future accidents; according to The Guardian, "the indemnity even covers accidents and leaks that are the consortium's fault." The indemnity had been rushed through prior to the summer parliamentary recess without notifying parliament. In 2009, Sellafield decommissioning accounted for 40% of the annual budget of the Nuclear Decommissioning Authority – over £1.1bn. In 2013, a critical Public Accounts Committee report stated that the private consortium managing Sellafield has failed to reduce costs and delays. Between 2005 and 2013 the annual costs of operating Sellafield increased from £900 million to about £1.6 billion. The estimated lifetime undiscounted cost of dealing with the Sellafield site increased to £67.5 billion. Bosses were forced to apologise after projected clean-up costs passed the £70 billion mark in late 2013. In 2014, the undiscounted decommissioning cost estimate for Sellafield was increased to £79.1 billion, and by 2015 to £117.4 billion. The annual operating cost will be £2 billion in 2016. Following the decision taken by the British government in January 1947 to develop nuclear weapons, Sellafield was chosen as the location of the plutonium production plant, consisting of the Windscale Piles and accompanying reprocessing plant to separate plutonium from the spent nuclear fuel. Unlike the early US nuclear reactors at Hanford, which consisted of a graphite core cooled by water, the Windscale Piles consisted of a graphite core cooled by air. Each pile contained almost 2,000 tonnes (1,968 L/T) of graphite, and measured over 7.3 metres (24 ft) high by 15.2 metres (50 ft) in diameter. Fuel for the reactor consisted of rods of uranium metal, approximately 30 centimetres (12 in) long by 2.5 centimetres (1 in) in diameter, and clad in aluminium. The initial fuel was loaded into the Windscale Piles in July 1950. By July 1952 the separation plant was being used to separate plutonium and uranium from spent fuel. On 10 October 1957, the Windscale Piles were shut down following a fire in Pile 1 during a routine maintenance check, which destroyed the core and released an estimated 750 terabecquerels (20,000 curies) of radioactive material, including 22 TBq of Cs-137 and 740 TBq of I-131 into the shafts. Thanks to innovative filters installed by Nobel laureate Sir John Cockcroft 95% of the material was captured. As a precautionary measure, milk from surrounding farming areas was destroyed. Following the fire, Pile 1 was unserviceable, and Pile 2, although undamaged by the fire, was shut down as a precaution. In the 1990s, the United Kingdom Atomic Energy Authority started to implement plans to decommission, disassemble and clean up both piles. In 2004 Pile 1 still contained about 15 tonnes (14.76 L/T) of uranium fuel, and final completion of the decommissioning is not expected until at least 2037. In 2014, radioactive sludge in the Pile Fuel Storage Pond (PFSP), built between 1948 and 1952, started to be repackaged in drums to reduce the "sludge hazard" and to allow the pond to be decommissioned. Decommissioning will require retrieval of sludge and solids, prior to dewatering and deconstruction, with retrievals planned for completion in 2016. The first generation reprocessing plant was built to extract the plutonium from spent fuel to provide fissile material for the UK's atomic weapons programme, and for exchange with the United States through the US-UK Mutual Defence Agreement. It operated from 1951 until 1964, with an annual capacity of 300 tonnes (295 L/T) of fuel, or 750 tonnes (738 L/T) of low burn-up fuel. It was first used to reprocess fuel from the Windscale Piles, and was later repurposed to process fuel from UK Magnox reactors, however following the commissioning of the dedicated Magnox Reprocessing Plant, it was itself recycled to become a pre-handling plant to allow oxide fuel to be reprocessed in the Magnox plant, and was closed in 1973. In 1964 the Magnox reprocessing plant came on stream to reprocess spent nuclear fuel from the Magnox reactors. The plant uses the "plutonium uranium extraction" Purex method for reprocessing spent fuel, with tributyl phosphate in odourless kerosene and nitric acid as extraction agents. The Purex process produces uranium, plutonium and fission products as output streams. Over the 30 years from 1971 to 2001 the Magnox Reprocessing Plant has reprocessed over 35,000 tonnes of Magnox fuel, with 15,000 tonnes of fuel being regenerated. Magnox fuel is reprocessed since it corrodes if stored underwater, and routes for dry storage have not yet been proven. The FGMSP was built to support reprocessing of fuel from UK Magnox power stations through the First Generation Reprocessing Plant, and was used for operations between 1960 until 1986. The pond is 20m wide, 150m long and 6m deep. A confinement wall is scheduled to be built in the future to help it withstand earthquakes. As of 2014, the First Generation Magnox Storage Pond (FGMSP) remains as a priority decommissioning project. As well as nuclear waste, the pond holds about 1,200 cubic metres of radioactive sludge of unknown characteristics and 14,000 cubic metres of contaminated water. Decommissioning initially requires retrieval of the radioactive sludge into a newly built Sludge Packaging Plant 1, as well as fuel and skip retrieval. Completion of this will allow the dewatering and dismantling of the remaining structure. Future work will immobilise the sludge for long-term storage, and process solids through the Fuel Handling Plant for treatment and storage. Calder Hall, first connected to the grid on 27 August 1956 and officially opened by Queen Elizabeth II on 17 October 1956, was the world's first power station to generate electricity on an industrial scale (four 60 MWe reactors) from nuclear energy; a 5 MWe experimental reactor at Obninsk in the Soviet Union had been connected to the public supply in 1954, and was the world's first nuclear power plant. The Calder Hall design was codenamed PIPPA (Pressurised Pile Producing Power and Plutonium) by the UKAEA to denote the plant's dual commercial and military role. Construction started in 1953. Calder Hall had four Magnox reactors capable of generating 60 MWe (net) of power each, reduced to 50 MWe in 1973. The reactors also supplied steam to the whole site for process and other purposes. The reactors were supplied by UKAEA, the turbines by C. A. Parsons and Company, and the civil engineering contractor was Taylor Woodrow Construction. When the station closed on 31 March 2003, the first reactor had been in use for nearly 47 years. In its early life Calder Hall primarily produced weapons-grade plutonium, with two fuel loads per year; electricity production was a secondary purpose. From 1964 it was mainly used on commercial fuel cycles; in April 1995 the UK Government announced that all production of plutonium for weapons purposes had ceased. Calder Hall had four cooling towers, built in 1950–56 to cool the water from the station. The towers were 88 metres in height and used the natural draught hyperboloid design. The towers stood for 50 years, creating a landmark visible from the village of Seascale. Plans for a museum involving renovating Calder Hall and preserving the towers were formulated, but the costs were too high. The cooling towers were demolished by controlled implosions on 29 September 2007, by Controlled Demolition, Inc. A period of 12 weeks was required to remove asbestos in the towers' rubble. The WAGR was a prototype for the UK's second generation of reactors, the advanced gas-cooled reactor or AGR, which followed on from the Magnox stations. The station had a rated thermal output of approximately 100MW and 30 MW electrical. The WAGR golfball is, along with the pile chimneys, one of the iconic buildings on the Windscale site (Windscale being an independent site within the Sellafield complex). Construction was carried out by Mitchell Construction and completed in 1962. This reactor was shut down in 1981, and is now part of a pilot project to demonstrate techniques for safely decommissioning a nuclear reactor. "1. Should oxide fuel from United Kingdom reactors be reprocessed in this country at all; whether at Windscale or elsewhere? 2. If yes, should such reprocessing be carried on at Windscale? 3. If yes, should the reprocessing plant be about double the estimated site required to handle United Kingdom oxide fuels and be used as to the spare capacity, for reprocessing foreign fuels?" The result of the inquiry was that the new plant, the Thermal Oxide Reprocessing Plant (THORP) was given the go ahead in 1978, although it did not go into operation until 1994. On 14 November 2018 it was announced that operations had ended at THORP. The facility will be used to store spent nuclear fuel until the 2070s. On 19 April 2005 83,000 litres of radioactive waste was discovered to have leaked in the THORP reprocessing plant from a cracked pipe into a huge stainless steel-lined concrete sump chamber built to contain leaks. A discrepancy between the amount of material entering and exiting the THORP processing system had first been noted in August 2004. Operations staff did not discover the leak until safeguards staff reported the discrepancies. 19 tonnes of uranium and 160 kilograms of plutonium dissolved in nitric acid has been pumped from the sump vessel into a holding tank. No radiation was released to the environment, and no one was injured by the incident, but because of the large escape of radioactivity to the secondary containment the incident was given an International Nuclear Event Scale level 3 categorisation. Sellafield Limited was fined £500,000 for breaching health and safety law. In January 2007 Sellafield was given consent to restart THORP. Highly Active Liquor Evaporation and Storage (HALES) is a department at Sellafield. It conditions nuclear waste streams from the Magnox and Thorp reprocessing plants, prior to transfer to the Waste Vitrification Plant. In 1991 the Waste Vitrification Plant (WVP), which seals high-level radioactive waste in glass, was opened. In this plant, liquid wastes are mixed with glass and melted in a furnace, which when cooled forms a solid block of glass. The plant has three process lines and is based on the French AVM procedure. Principal item is an inductively heated melting furnace, in which the calcined waste is merged with glass frit (glass beads of 1 to 2 mm in diameter). The melt is placed into waste containers, which are welded shut, their outsides decontaminated and then brought into air-cooled storage facilities. This storage consists of 800 vertical storage tubes, each capable of storing ten containers. The total storage capacity is 8000 containers, and 5000 containers have been stored to 2010. Vitrification should[vague] ensure safe storage of waste in the UK for the middle to long term. Construction of the Sellafield MOX Plant (SMP) was completed in 1997, though justification for the operation of the plant was not achieved until October 2001. Mixed oxide, or MOX fuel, is a blend of plutonium and natural uranium or depleted uranium which behaves similarly (though not identically) to the enriched uranium feed for which most nuclear reactors were designed. MOX fuel is an alternative to low enriched uranium (LEU) fuel used in the light water reactors which predominate in nuclear power generation. MOX also provides a means of using excess weapons-grade plutonium (from military sources) to produce electricity. Designed with a plant capacity of 120 tonnes/year, it achieved a total output of only 5 tonnes during its first five years of operation. In 2008 orders for the plant had to be fulfilled at COGEMA in France, and the plant was reported in the media as "failed" with a total construction and operating cost of £1.2 billion. On 12 May 2010 an agreement was reached with existing Japanese customers on future MOX supplies. In July 2010 Areva was contracted to design and supply a new rod line to improve reliability and production rate. On 3 August 2011 the Nuclear Decommissioning Authority announced that the MOX Plant would close, due to the loss of Japanese orders following the Fukushima Daiichi nuclear disaster. Japanese orders for MOX recommenced on 17 April 2013, being supplied by the Sellafield MOX plant's main competitor, the French MOX fuel vendor COGEMA owned by Areva. Since its early days, Sellafield has discharged low-level radioactive waste into the sea, using a flocculation process to remove radioactivity from liquid effluent before discharge. Metals dissolved in acidic effluents produced a metal hydroxide flocculant precipitate following the addition of ammonium hydroxide. The suspension was then transferred to settling tanks where the precipitate would settle out, and the remaining clarified liquid, or supernate, would be discharged to the Irish Sea. In 1994 the Enhanced Actinide Removal Plant (EARP) was opened. In EARP the effectiveness of the process is enhanced by the addition of reagents to remove the remaining soluble radioactive species. EARP was enhanced in 2004 to further reduce the quantities of technetium-99 released to the environment. Sellafield product and residue store – Site store for plutonium and plutonium residues – The plutonium stockpile now estimated (November 2013) at 100 tonnes. The UK's main Low Level Waste Repository for nuclear waste is 6 kilometres (3.7 mi) south east of Sellafield at Drigg. A paper published in 1989 said that 70% of the waste received at Drigg originated from Sellafield. Fellside Power Station is a 168 MWe CHP gas-fired power station near the Sellafield site, which it supplies with steam and heat. It is run as Fellside Heat and Power Ltd, is wholly owned by Sellafield Ltd and is operated & managed by PX Ltd. It was built in 1993, being originally equally owned by BNFL and Scottish Hydro Electric (which became Scottish and Southern Energy in December 1998). The station uses three General Electric Frame 6001B gas turbines, with power entering the National Grid via a 132kV transformer. The turbines in Fellside Power Station are natural gas fired and are also able to run on distillate (diesel) fuel. BNFL bought SSE's 50% share in January 2002. Sellafield directly employs around 10,000 people and is one of the two largest non-governmental employers in West Cumbria (along with BAE Systems at Barrow-in-Furness), with approximately 90% of the employees coming from West Cumbria. Because of the increase in local unemployment following any run down of Sellafield operations, the Nuclear Decommissioning Authority (and HMG) is concerned that this needs to be managed. The Central Laboratory at Sellafield is the headquarters of the National Nuclear Laboratory and is the flagship nuclear Research and Development facility in the UK. It supports newly built reactors, operation of reactors, operations of fuel processing plants and decommissioning and clean-up. The NNL's Central Laboratory is available to run a wide range of radioactive and non-radioactive experimental programmes. In addition, it offers a wide range of analytical services, building on its location on the Sellafield site and considerable expertise of its resident technologists. Customers range from Government and the NDA to site licence companies, utilities, nuclear specialists and universities. The facility has been designed with flexibility and collaboration firmly at its heart. Smaller experiments can be easily set, taking advantage of the modular nature of the laboratories. Larger experiments and rigs can be assembled off site, installed and pre-tested in non-radioactive areas prior to active testing. At its peak, the Sellafield Visitors' Centre attracted an average of 1,000 people per day. In recent years, its popularity deteriorated, prompting the change from tourist attraction to conference facility. It is now[when?] the Business and Information Centre and is open Mon – Fri only. The centre is used for business events such as supplier forums and 'Meet the Buyer' events. The Visitors Centre is completely closed, and there are no areas for the public to visit. Between 1950 and 2000 there were 21 serious incidents or accidents involving off-site radiological releases that warranted a rating on the International Nuclear Event Scale, one at level 5, five at level 4 and fifteen at level 3. Additionally during the 1950s and 1960s there were protracted periods of known, deliberate discharges to the atmosphere of plutonium and irradiated uranium oxide particulates. These frequent incidents, together with the large 2005 THORP plant leak which was not detected for nine months, have led some to doubt the effectiveness of the managerial processes and safety culture on the site over the years. In the effort to build an independent British nuclear weapon in the 1940s and 1950s, the Sellafield plant was constructed; diluted radioactive waste was discharged by pipeline into the Irish Sea. Greenpeace claims that the Irish Sea remains one of the most heavily contaminated seas in the world because of these discharges. Ocean scientist David Assinger has challenged this general suggestion, and cites the Dead Sea as the most radioactive sea in the world. The Convention for the Protection of the Marine Environment of the North-East Atlantic (OSPAR Convention) reports an estimated 200 kilograms (441 lb) of plutonium has been deposited in the marine sediments of the Irish Sea. Cattle and fish in the area have been contaminated with plutonium-239 and caesium-137 from these sediments and from other sources such as the radioactive rain that fell on the area after the Chernobyl disaster. Most of the area's long-lived radioactive technetium comes from the reprocessing of spent nuclear fuel at the Sellafield facility. Technetium-99 is a radioactive element which is produced by nuclear fuel reprocessing, and also as a by-product of medical facilities (for example Ireland is responsible for the discharge of approximately 11 grams or 6.78 gigabecquerels of technetium-99 each year despite not having a nuclear industry). Because it is almost uniquely produced by nuclear fuel reprocessing, technetium-99 is an important element as part of the OSPAR Convention since it provides a good tracer for discharges into the sea. In itself, the technetium discharges do not represent a significant radiological hazard, and recent studies have noted "...that in the most recently reported dose estimates for the most exposed Sellafield group of seafood consumers (FSA/SEPA 2000), the contributions from technetium-99 and actinide nuclides from Sellafield (<100 µSv) was less than that from 210Po attributable to discharges from the Whitehaven phosphate fertilizer plant and probably less than the dose from naturally occurring background levels of 210Po." Because of the need to comply with the OSPAR Convention, British Nuclear Group (the licensing company for Sellafield) has recently commissioned a new process in which technetium-99 is removed from the waste stream and vitrified in glass blocks. Discharges into the sea of radioactive effluents – mainly caesium-137 – from Sellafield amounted to 5200 TBq during the peak year, 1975. There has been concern that the Sellafield area will become a major dumping ground for unwanted nuclear material, since there are currently no long-term facilities for storing High-Level Waste (HLW), although the UK has current contracts to reprocess spent fuel from all over the world. Contracts agreed since 1976 between BNFL and overseas customers require that all HLW be returned to the country of origin. The UK retains low- and intermediate-level waste resulting from its reprocessing activity, and instead ships out a radiologically equivalent amount of its own HLW. This substitution policy is intended to be environmentally neutral and to speed return of overseas material by reducing the number of shipments required, since HLW is far less bulky. Radiation around the pool can get so high that a person is not allowed to stay more than 2 minutes, seriously affecting decommissioning. The pool is not watertight; time and weather have created cracks in the concrete, letting contaminated water leak. In 2007 an inquiry was launched into the removal of tissue from a total of 65 dead nuclear workers, some of whom worked at Sellafield. It has been alleged that the tissue was removed without seeking permission from the relatives of the late workers. Michael Redfern QC has been appointed to lead the investigation. At the same time The Observer revealed that official documents showed that during the 1960s volunteer workers at Sellafield had participated in secret Cold War experiments to assess the biological effect of exposure to radioactive substances, such as from ingesting caesium-134. The inquiry final report was published in November 2010, reporting that "...body parts had been removed between 1961 and 1992. The deaths of 76 workers – 64 from Sellafield and 12 from other UK nuclear plants – were examined, although the scope of the inquiry was later significantly widened." The person behind this scheme was Dr Geoffrey Schofield, who became BNFL's Company chief medical officer, and who died in 1985. Sellafield staff did not breach any legal obligation, did not consider their actions untoward, and published the scientific information obtained in peer-reviewed scientific journals. It was the hospital pathologists, who were profoundly ignorant of the law, who breached the Human Tissue Act 1961 by giving Sellafield human organs, without any consents, under an informal arrangement. A 1997 Ministry of Health report stated that children living close to Sellafield had twice as much[quantify] plutonium in their teeth as children living more than 100 miles (160 km) away. Health Minister Melanie Johnson said the quantities were minute and "presented no risk to public health". This claim, according to a book written by Stephanie Cooke, was challenged by Professor Eric Wright, an expert on blood disorders at the University of Dundee, who said that even microscopic amounts of the man-made[clarification needed] element might cause cancer. Studies carried out by the Committee on Medical Aspects of Radiation in the Environment (COMARE) in 2003 reported no evidence of raised childhood cancer in general around nuclear power plants, but did report an excess of leukaemia (cancer of the blood or bone) and non-Hodgkin's lymphoma (NHL) (blood cancer) near two other nuclear installations including Sellafield, the Atomic Weapons Establishment Burghfield and UKAEA Dounreay. COMARE's conclusion was that "the excesses around Sellafield and Dounreay are unlikely to be due to chance, although there is not at present a convincing explanation for them". In earlier reports COMARE had suggested that "...no single factor could account for the excess of leukaemia and NHL but that a mechanism involving infection may be a significant factor affecting the risk of leukaemia and NHL in young people in Seascale." In a study published in the British Journal of Cancer, which also did not find an increase in any other cancers other than Leukemia, the authors of which attempted to quantify the effect population mixing might have on the Seascale leukaemia cluster. In the analysis of childhood leukaemia/NHL in Cumbria, excluding Seascale, they noted that if both parents were born outside the Cumbrian area (incomers), there was a significantly higher rate of leukaemia/NHL in their children. 1181 children were born in the village of Seascale between 1950 and 1989, in children aged 1–14 during this period, the Seascale cluster of 6 observed cases of NHL were noted. Two similarly aged children, born between 1950 and 1989, outside Seascale were also diagnosed with ALL/NHL before the end of 1992. The origin of birth of 11 of the 16 parents of these eight children was known, and found to be; 3 had parents born outside Cumbria and 3 had one parent born outside the UK. The studies authors strongly supported the hypothesis that the risk of ALL/NHL, in particular in the younger age group, increases with increased exposure to population mixing during gestation or early in life. Although they determined that the exact mechanism by which it causes these malignancies, apart from Kinlen's infection aetiology that was mentioned, remained unknown, concluding that the possibility of additional risk factors in Seascale remains. In an examination of all causes of stillbirth and infant mortality in Cumbria taken as a whole, between 1950 and 1993, 4,325 stillbirths, 3,430 neonatal death and 1,569 lethal congenital anomalies, occurred among 287,993 births. Overall, results did not infer an increased risk of still birth or neonatal death in Cumbria, the rate of these negative outcomes were largely in line with the British baseline rate. However, there was a cautioned connection between a small excess of increased risk of death from lethal congenital anomalies and proximity to municipal waste incinerators and chemical waste crematoriums being noted. With two examples of the latter crematoriums operating in both Barrow-in-Furness and further afield at Carlisle, crematoriums which may have emitted various chemical dioxins during their operation. 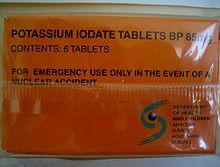 An unopened box of potassium iodate tablets, distributed to every household in Ireland in the wake of 9/11 in case of a terror attack on reprocessing plants and nuclear power stations in Britain. Upon later expert Irish examination in 2007, this was found not to have been justified. The Irish Department of Health advises that the tablets may now be disposed of with municipal waste. Sellafield has been a matter of consternation in Ireland, with the Irish Government and some of the population concerned at the risk that such a facility may pose to the country. The Irish government has made formal complaints about the facility, and in 2006 came to an agreement with the British Government about the matter, as part of which the Radiological Protection Institute of Ireland and the Garda Síochána (the Irish police force) are now allowed access to the site. The Government of the Isle of Man has also registered protests due to the risk posed by radioactive contamination, due to the proximity of the Isle of Man. The Manx government has called for the site to be shut down. The Irish and Manx governments have collaborated on this issue, and brought it to the attention of the British-Irish Council. Similar objections to those held by the Irish government have been voiced by the Norwegian government since 1997. Monitoring undertaken by the Norwegian Radiation Protection Authority has shown that the prevailing sea currents transport radioactive materials leaked into the sea at Sellafield along the entire coast of Norway and water samples have shown up to ten-fold increases in such materials as technetium-99. The Norwegian government is also seeking closure of the facility. The MOX Demonstration Facility was a small-scale plant to produce commercial quality MOX fuel for light water reactors. The plant was commissioned between 1992 and 1994, and until 1999 produced fuel for use in Switzerland, Germany and Japan. In 1999 it was discovered that the plant's staff had been falsifying quality assurance data since 1996. A Nuclear Installations Inspectorate (NII) investigation concluded four of the five work-shifts were involved in the falsification, though only one worker admitted to falsifying data, and that "the level of control and supervision ... had been virtually non-existent.". The NII stated that the safety performance of the fuel was not affected as there was also a primary automated check on the fuel. Nevertheless, "in a plant with the proper safety culture, the events described in this report could not have happened" and there were systematic failures in management. BNFL had to pay compensation to the Japanese customer, Kansai Electric, and take back a flawed shipment of MOX fuel from Japan. BNFL's Chief Executive John Taylor resigned, after initially resisting resignation when the NII's damning report was published. On 17 February 2005, the UK Atomic Energy Authority reported that 29.6 kilograms (65 lb) of plutonium was unaccounted for in auditing records at the Sellafield nuclear fuel reprocessing plant. The operating company, the British Nuclear Group, described this as a discrepancy in paper records and not as indicating any physical loss of material. They pointed out that the error amounted to about 0.5%, whereas International Atomic Energy Agency regulations permit a discrepancy up to 1% as the amount of plutonium recovered from the reprocessing process never precisely matches the pre-process estimates. The inventories in question were accepted as satisfactory by Euratom, the relevant regulatory agency. Sellafield's biggest decommissioning challenges relate to the leftovers of the early nuclear research and nuclear weapons programmes. Sellafield houses "the most hazardous industrial building in western Europe" and the second-most hazardous, which hold a variety of leftovers from the first Magnox plants in ageing ponds. Some of the problems with The second most date back to the 1972 miners' strike: the reactors were pushed so hard that waste processing could not keep up, and "cladding and fuel were simply thrown into it’s cooling ponds and left to disintegrate." Some of the problems date back to the original nuclear weapons programme at Sellafield, when Piles 1 and 2 were constructed at breakneck speed, and safe disposal was not a priority. One building still houses the aluminium cladding for the uranium fuel rods of Piles 1 and 2, and is modelled on a grain silo, with waste tipped in at the top and argon gas added to prevent fires. Sting's 1985 song, "We Work the Black Seam", about the UK miners' strike (1984–85), included the line, "the poisoned streams in Cumberland", amongst other references suggesting that nuclear power had led to the collapse of the coal mining industry. In 2010 Post-Punk group Spear of Destiny wrote the song "Windscale" on their album Omega Point which referenced the fire in 1957. In 1992, rock bands U2, Public Enemy, Big Audio Dynamite II, and Kraftwerk held a "Stop Sellafield" concert for Greenpeace to protest against the nuclear factory. Stop Sellafield: The Concert was later released that year on VHS in the UK, and all proceeds went directly to Greenpeace. Kraftwerk mentions Sellafield in the intro of the 1991 version of the song Radioactivity together with Chernobyl, Harrisburg and Hiroshima. On their 2005 live album Kraftwerk preface a live performance of Radioactivity with a vocoder voice announcing: Sellafield 2 will produce 7.5 tons of plutonium every year. 1.5 kilogram of plutonium make a nuclear bomb. Sellafield 2 will release the same amount of radioactivity into the environment as Chernobyl every 4.5 years. One of these radioactive substances, Krypton 85, will cause death and skin cancer. Déanta, a traditional Irish band from Northern Ireland, refers to Sellafield and its nuclear dangers in their song "Cold Grey Fairyland". Runrig A Scottish folk-rock group, mention Sellafield in their 1993 song 'Move a Mountain'. Fallout, a 2006 drama shown on the Irish national TV station RTÉ, based on the false premise that parts of Ireland would need to be evacuated following a serious accident at Sellafield, following the accident there are evacuation riots, societal collapse and widespread health impacts. 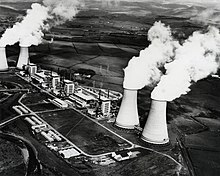 Sellafield was the subject of Marilynne Robinson's 1989 book, Mother Country: Britain, the Welfare State, and Nuclear Pollution, a critique of British nuclear policy. Sellafield is the central theme of Les Barker's comic poem 'Jason and the Arguments,' and is also mentioned in other Barker works. Norman Nicholson's poem Windscale, which refers to the 1957 accident, is a commentary on the poison that Nicholson believed nuclear power had introduced to an area of natural beauty. ^ "NMP Company Profile". Nuclear Management Partners. Archived from the original on 4 August 2010. Retrieved 19 June 2010. ^ "UK to change way Sellafield is managed". World Nuclear News. Retrieved 4 July 2015. ^ Kragh, Helge (1999). Quantum Generations: A History of Physics in the Twentieth Century. Princeton NJ: Princeton University Press. p. 286. ISBN 978-0-691-09552-3. ^ Historic England. "Royal Ordnance Factory Sellafield (1075104)". PastScape. Retrieved 21 August 2015. ^ Historic England. "Royal Ordnance Factory Drigg (1075121)". PastScape. Retrieved 21 August 2015. ^ Cassidy, Nick, and Patrick Green. 1993. Sellafield: The contaminated legacy. London: Friends of the Earth. ^ Openshaw, Stan, Steve Carver, and John Fernie. 1989. Britain's nuclear waste: Siting and safety. London: Bellhaven Press. ^ "Our plans". NuGeneration. Archived from the original on 6 November 2011. Retrieved 15 November 2011. ^ "Cumbria shooting rampage suspect's 'body found'". BBC News. 2 June 2010. Retrieved 2 June 2010. ^ "Nuclear power: Eight sites identified for future plants". BBC News. BBC. 18 October 2010. Retrieved 18 October 2010. ^ "New UK nuclear plant sites named". BBC News. BBC. 23 June 2011. Retrieved 23 June 2011. ^ Nuclear Decommissioning Authority – Progress on the Sellafield site: an update (PDF) (Report). National Audit Office. March 2015. Retrieved 16 March 2015. ^ a b "Nuclear Provision: the cost of cleaning up Britain's historic nuclear sites". NDA. 1 September 2016. Retrieved 26 February 2017. ^ Geoffrey Lean, 'Shambolic' Sellafield in crisis again after damning safety report, The Independent, 3 February 2008. ^ "Sellafield clean-up cost reaches 67.5bn, says report". BBC. 4 February 2013. Retrieved 19 February 2013. ^ Terry Macalister (4 February 2013). "Sellafield management sharply criticised by Commons committee". The Guardian. Retrieved 19 February 2013. ^ Nuclear Decommissioning Authority: Managing risk at Sellafield (PDF). Committee of Public Accounts (Report). House of Commons. 23 January 2013. Retrieved 19 February 2013. ^ Macalister, Terry (4 December 2013). "Sellafield bosses forced to say sorry over £70bn-plus cleanup costs". theguardian.com. Retrieved 5 December 2013. ^ Gosden, Emily (23 June 2014). "Britain's nuclear clean-up bill soars to £110bn". The Telegraph. Retrieved 13 January 2015. ^ "UK decommissioning agency lays out plans to 2019". World Nuclear News. 6 January 2016. Retrieved 26 February 2017. ^ a b c George Coupe (14 May 2004). "Getting to the core issue". The Engineer. Archived from the original on 5 September 2008. Retrieved 23 October 2008. ^ Sutyagin, Igor (1996). "The Role of Nuclear Weapons And Its Possible Future Missions". NATO. pp. I.3. The Great Britain. Retrieved 23 October 2008. ^ unattributed (n.d.). "Sellafield Ltd Timeline". Sellafield Ltd. Archived from the original on 5 October 2008. Retrieved 23 October 2008. ^ F. R. Farmer, J. R. Beattie (1976). Ernest J. Henley, Jeffery Lewins (ed.). "Nuclear Power Reactors and the Evaluation of Population Hazards". Advances in Nuclear Science and Technology. New York: Academic Press. 9: 1–69. ISBN 9781483215662. ^ Leatherdale, Duncan (4 November 2014). "Windscale Piles: Cockcroft's Follies avoided nuclear disaster". BBC. Retrieved 12 August 2015. ^ "Sellafield's oldest nuclear waste being 'repackaged'". BBC. 12 July 2014. Retrieved 13 July 2014. ^ "Sellafield's oldest nuclear storage pond to be decommissioned". BBC. 12 June 2014. Retrieved 13 July 2014. ^ "Risk & Hazard Reduction: Pile Fuel Storage Pond". Sellafield Ltd. Archived from the original on 6 July 2015. Retrieved 4 July 2015. ^ "Risk & Hazard Reduction: First Generation Reprocessing Plants". Sellafield Ltd. Archived from the original on 6 July 2015. Retrieved 4 July 2015. ^ "History of Sellafield". Sellafield Web Page. Retrieved 21 August 2006. ^ "Continued discharges from Sellafield for ten more years". Bellona. Archived from the original on 27 September 2007. Retrieved 21 August 2006. ^ "RWMAC's Advice to Ministers on the Radioactive Waste Implications of Reprocessing". RWMAC. Archived from the original on 19 August 2006. Retrieved 21 August 2006. ^ "The cold probe for sampling at Sellafield". Nuclear Engineering International. 22 January 2014. Retrieved 8 February 2014. ^ "Risk & Hazard Reduction: First Generation Magnox Storage Pond". Sellafield Ltd. Archived from the original on 6 July 2015. Retrieved 4 July 2015. ^ The Atom Joins the Grid. British Pathe. 22 October 1956. Retrieved 5 March 2011. ^ "Calder Hall Power Station". The Engineer. 5 October 1956. Retrieved 27 October 2013. Brief description, with link to very detailed article. ^ "Nuclear Power in Russia". World Nuclear Association. Retrieved 30 October 2013. "... civil reactors ... an experimental 50 MWt LWGR type at Obninsk which started up in 1954 (5 MWe) and was the forerunner of RBMKs"
^ Nuclear Engineering International: Obninsk – number one, by Lev Kotchetkov, who was there at the time "Although utilisation of generated heat was going on ... the main task was to carry out experimental studies"
^ Wired. "June 27, 1954: World's First Nuclear Power Plant Opens". ^ "The Nuclear Businesses". Archived from the original on 27 September 2007. ^ "United Kingdom of Great Britain and Northern Ireland: Nuclear Power Reactors". PRIS database. International Atomic Energy Agency. Archived from the original on 28 June 2011. Retrieved 5 March 2011. ^ a b "nuclear-uk". Archived from the original on 19 July 2009. ^ "Calder Hall Nuclear Power Station". Engineering Times. Archived from the original on 7 March 2012. Retrieved 19 September 2010. ^ Brown, Paul (14 April 2003). "First nuclear power plant to close". The Guardian. London. Retrieved 21 August 2006. ^ Peter Hayes. "Should the United States supply light water reactors to Pyongyang?". Nautilus Pacific Research. Archived from the original on 7 March 2006. Retrieved 21 August 2006. ^ "Sellafield towers are demolished". BBC News. 29 September 2007. Retrieved 29 September 2007. ^ "Project WAGR". Archived from the original on 1 October 2011. ^ "Windscale Inquiry". BOPCRIS – Unlocking Key British Government Publications. Archived from the original on 12 February 2006. Retrieved 21 August 2006. ^ "Reprocessing ceases at UK's Thorp plant". World Nuclear News. 14 November 2018. Retrieved 15 November 2018. ^ a b Nuclear Directorate. "Thermal Oxide Reprocessing Plant (THORP) leak investigation and consent to restart". Health and Safety Executive. Retrieved 9 June 2012. ^ a b Malcolm Wicks (22 February 2008). "Hansard, Written Answers: Sellafield". "Hansard. 22 February 2008 : Column 1034W. Archived from the original (– Scholar search) on 13 March 2008. Retrieved 12 March 2008. ^ Geoffrey Lean (9 March 2008). "'Dirty bomb' threat as UK ships plutonium to France". London: "The Independent. Retrieved 12 March 2008. ^ Geoffrey Lean (9 March 2008). "Minister admits total failure of Sellafield 'MOX' plant". The Independent. London. Retrieved 12 March 2008. ^ "MOX Fuel Output for Shikoku Electric Power to Begin in March". The Japan Corporate News Network. 29 February 2008. Archived from the original on 5 August 2009. Retrieved 12 March 2008. ^ Jon Swaine (7 April 2009). "Nuclear recycling plant costs £1.2 billion and still doesn't work". The Daily Telegraph. London. Retrieved 7 April 2009. ^ "Areva will supply new rod line at Sellafield MOX plant". Nuclear Engineering International. 2 July 2010. Archived from the original on 13 June 2011. Retrieved 6 July 2010. ^ "UK MOX plant to close". Nuclear Engineering International. 3 August 2011. Archived from the original on 29 May 2012. Retrieved 3 August 2011. ^ (http://www.forepoint.co.uk), Forepoint. "Mox fuel shipment from France to Japan departs - PNTL - Pacific Nuclear Transport Ltd". ^ Ben Irons. "Treating a 50-year-old legacy of radioactive sludge waste". Engineer Live. Archived from the original on 26 January 2007. Retrieved 21 August 2006. ^ Sellafield Site Summary – 2006/07 Lifetime Plan (Rev. A Issue 2). British Nuclear Group (Report). Nuclear Decommissioning Authority. 20 April 2006. Archived from the original on 10 November 2007. Retrieved 16 August 2010. ^ "delegates focus on use of plutonium". Whitehavennews. 25 June 2014. Archived from the original on 4 December 2013. ^ "BNF shows its rubbish dump". The Journal. Newcastle upon Tyne, UK: Newcastle Chronicle and Journal Ltd: 18. 25 January 1989. ^ "British Nuclear Fuels plc's completed acquisition of Fellside Heat and Power Limited" (PDF). OFGEM. March 2002. Retrieved 8 December 2008. ^ "Site Statistics". NuclearSites Web Site. Archived from the original on 27 September 2007. Retrieved 21 August 2006. ^ "THE ECONOMY OF CUMBRIA: THE SIGNIFICANCE OF MAJOR EMPLOYERS" (PDF). Centre for Regional Economic Development. Archived from the original (PDF) on 21 February 2007. Retrieved 21 August 2006. ^ "Nuclear decommissioning at Sellafield". BBC News. Retrieved 21 August 2006. ^ G A M Webb (March 2006). "Classification of events with an off-site radiological impact at the Sellafield site between 1950 and 2000, using the International Nuclear Event Scale". Journal of Radiological Protection. 26 (1): 33–49. Bibcode:2006JRP....26...33W. doi:10.1088/0952-4746/26/1/002. PMID 16522943. ^ "Sellafield nuclear reprocessing facility - Greenpeace UK". Archived from the original on 3 March 2016. ^ http://www.challenger-society.org.uk/node/95 The Irish Sea: Not the Most Radioactive Sea in the World. ^ "Quality Status Report 2000 for the North East-Atlantic (Regional QSR III, Chapter 4 Chemistry, p66" (PDF). OSPAR Commission. Archived from the original (PDF) on 27 September 2007. Retrieved 3 June 2007. ^ "Technetium-99 Behavior in the Terrestrial Environment – Field Observations and Radiotracer Experiments-" (PDF). Journal of Nuclear and Radiochemical Sciences, Vol. 4, No.1, pp. A1-A8, 2003. Archived from the original (PDF) on 24 July 2006. Retrieved 23 August 2006. ^ "Report of Ireland on the Implementation of the OSPAR Strategy with regard to Radioactive Substances (June 2001)" (PDF). Department of Environment, Heritage and Local Government. pp. 2 para.9. Archived from the original (PDF) on 30 May 2008. Retrieved 4 April 2008. ^ "News Release: MINISTERS ANNOUNCE DECISION ON TECHNETIUM-99". Department for Environment, Food and Rural Affairs. Archived from the original on 12 September 2006. Retrieved 23 August 2006. ^ J D Harrison; et al. "Gut transfer and doses from environmental technetium". J. Radiol. Prot. 21 9-11. Retrieved 23 August 2006. ^ "44 years of discharges prevented after early end to Sellafield waste programme". Latest News: British Nuclear Group, 26th January 2006. Archived from the original on 20 May 2006. Retrieved 23 August 2006. ^ "State of the Environment Norway : Releases of caesium-137 from Sellafield". Norwegian Radiation Protection Authority. 20 November 2011. Archived from the original on 26 July 2014. Retrieved 1 September 2013. ^ "INTERMEDIATE LEVEL RADIOACTIVE WASTE SUBSTITUTION" (PDF). DTI. Archived from the original (PDF) on 9 December 2006. Retrieved 23 August 2006. ^ Morris, Michael (18 February 1984). "Warnings go up on nuclear site beaches". The Guardian. UK: Guardian Newspapers: 3. ^ Please add first missing authors to populate metadata. (22 December 1983). "Sellafield". Hansard. ^ "Written answers for Friday 5th May 2000". Hansard. Retrieved 21 August 2006. ^ "Science: Leukaemia and nuclear power stations". New Scientist. Retrieved 21 August 2006. ^ "European Commission - PRESS RELEASES - Press release - Nuclear safeguards: the Commission imposes binding measures to put an end to an infringement at the Sellafield site in the United Kingdom". ^ "Windscale, une passoire nucléaire rebaptisée Sellafield". ^ BBC. "So what the heck is this Sellafield thing all about?". ^ "Sellafield organ removal inquiry". BBC News. 18 April 2007. Retrieved 18 May 2007. ^ Walker, Peter (10 July 2007). "Sellafield body parts scandal". The Guardian. London. Retrieved 25 September 2008. ^ Doward, Jamie (22 April 2007). "Revealed: UK nuclear tests on workers". The Observer. London. Retrieved 17 November 2010. ^ a b Michael Redfern (16 November 2010). The Redfern Inquiry into human tissue analysis in UK nuclear facilities (Report). The Stationery Office. ISBN 978-0-10-296618-3. Retrieved 18 November 2010. ^ Brown, Jonathan (17 November 2010). "How Sellafield 'mutilated' its workers' bodies". The Independent. London. ^ Stephanie Cooke (2009). In Mortal Hands: A Cautionary History of the Nuclear Age, Black Inc., p. 356. ^ "COMARE 10th Report: The incidence of childhood cancer around nuclear installations in Great Britain". Committee on Medical Aspects of Radiation in the Environment. Retrieved 25 August 2006. ^ "Summary of the work of COMARE as published in its first six reports" (PDF). Committee on Medical Aspects of Radiation in the Environment. Retrieved 25 August 2006. ^ a b "Decision to Discontinue the Future Distribution of Iodine Tablets - Department of Health". ^ "Irish Sellafield appeal ruled illegal". The Guardian. 30 May 2006. Retrieved 27 October 2013. ^ "Celtic League join call to close down Sellafield". Isle of Man Today. 23 November 2009. Archived from the original on 15 September 2012. ^ "MANNON/ISLE OF MAN: SELLAFIELD – OPPOSITION RESTATED BY MANX GOVERNMENT". agencebretagnepresse.com. 18 April 2009. Archived from the original on 1 August 2013. Retrieved 12 December 2018. ^ Brown, Paul (20 December 1997). "Norway fury at UK nuclear waste flood". The Guardian. UK: Guardian Newspapers: 11. ^ "Norway concerned over reopening of THORP facility at Sellafield". norway.org.uk. Retrieved 8 January 2009. ^ Watts, Jonathan; Paul Brown (15 September 1999). "Japan launches inquiry into BNFL". Guardian Newspapers. p. 9. ^ Nuclear Installations Inspectorate (18 February 2000). "An Investigation into the Falsification of Pellet Diameter Data in the MOX Demonstration Facility at the BNFL Sellafield Site and the Effect of this on the Safety of MOX Fuel in Use". Archived from the original on 24 September 2006. Retrieved 18 November 2006. ^ "BNFL ends Japan nuclear row". BBC. 11 July 2000. Retrieved 18 November 2006. ^ "Safety overhaul at Sellafield". BBC. 17 April 2000. Retrieved 18 November 2006. ^ "BNFL chief determined to stay despite damning safety report". Daily Telegraph. 19 February 2000. Archived from the original on 20 November 2002. Retrieved 18 November 2006. ^ Nolan Fell (1 April 2000). "BNFL in crisis". Nuclear Engineering International. Retrieved 17 January 2014. ^ "Missing plutonium 'just on paper'". BBC News. 17 February 2005. Retrieved 22 August 2006. ^ Taylor, Andrew (18 February 2005). "Auditors clear BNFL over missing plutonium". Financial Times. Retrieved 27 February 2017. ^ "Radioactivity video". Minimum-Maximum. Daily Motion. Retrieved 22 May 2013. ^ "RTE's docudrama scenario could not happen according to RPII". Radiological Protection Institute of Ireland. Archived from the original on 15 October 2013. Retrieved 17 October 2013. The Radiological Protection Institute of Ireland (RPII) has said that the scenario as depicted in tonight's RTÉ drama, Fallout, could not happen. The RPII, who viewed the drama...has analysed the scenario as depicted and has concluded that it is not possible for such an accident to occur in Sellafield. ^ http://www.edie.net/news/1/Irish-battle-fallout-from-nuclear-TV-show/11367/ Dr Ann McGarry, chief executive of the Radiological Protection Institute of Ireland, said: "The scenario envisaged in the programme is not realistic and grossly exaggerates the amount of radioactivity that could reach Ireland. The RPII cannot envisage any realistic scenario that would cause the radiation levels in Ireland to reach the concentrations as what was depicted in the drama"
^ "Irish battle fallout from nuclear TV show". Ritchie, Berry (1997). The Good Builder: The John Laing Story. James & James. Wikimedia Commons has media related to Sellafield. "Britain's Pioneer Atomic Power Plants." Popular Mechanics, June 1954, pp. 74–75, cutaway drawing of facilities.